This week marks the point where Camden South Capitol will "top off", which means construction of the 276-unit apartment building has reached its full height a year after construction began. It took about six months to dig the foundation and reach ground level and another six months to reach its full height. In about a year, leasing will begin at Camden South Capitol, which is located across the street from Nationals Park. Local architecture firm WDG has designed the apartment building, which will have a rooftop pool with BBQ grills and outdoor fire pit, cyber cafe, and a resident gaming lounge with kitchen. In-unit features will include: Energy Star stainless steel appliances, electric oven ranges with ceramic glass cook tops, solar shades, 42" upper cabinets, double vanities in select units, garden soaking tubs, and stand-up showers in select units. 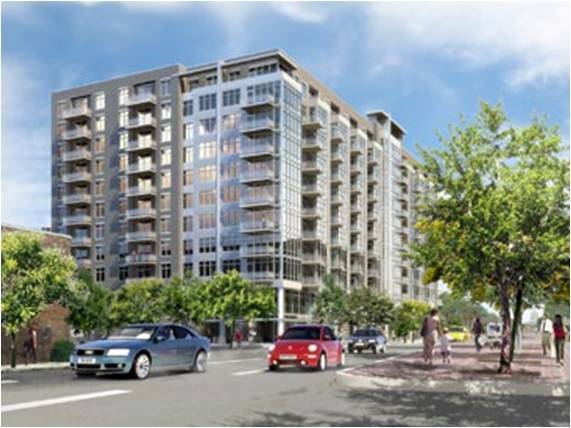 Space for ground-floor retail will be located at the corner of South Capitol and O Streets. Anyone know what this means? "...garden soaking tubs, and stand-up showers in select units." Bob: Some units will have larger than average tubs (ones that people can actually lay in comfortably) and others will have showers without a bathtub. Review of "The Music Man"